I wore my WSFS Captain's uniform to work today. Here's what it looked like. Two annoyances: 1. I forgot the tie, which I think detracts from the look but which nobody else seems to notice. 2. To wear my belt with this requires more holes than the belt has. The slacks are actually too small, although I can barely squeeze into them, but I can't tighten the belt over it. To my amazement, none of the twenty or thirty people in my office has a multi-tool. I'm so used to being at SF/F conventions, where the chance of finding a multi-tool approaches certainty as the number of fans approaches three, that I was astounded to find nobody with a Leatherman or Swiss-Army-style device. I improvised with a pair of scissors (dangerous) and a screwdriver and managed to get a new hole drilled. I guess I need a new, shorter belt, which isn't such a bad problem to have. One of my co-workers asked if this was my old uniform from when I was in the Navy. 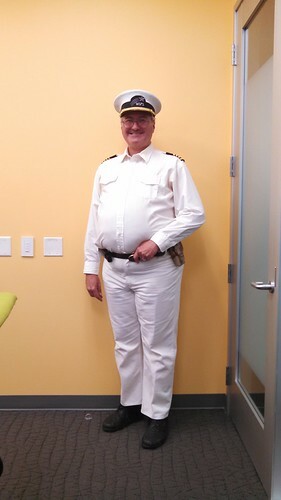 Well, no, and I've never been in the Navy or worked on a cruise ship, but I take this as a compliment, as it shows that the outfit doesn't look like an obvious costume bought at a Halloween store. All of the pieces are stock except for the logo customization. That's why I've been able to wear it so many times. I'm trying to get away as soon as I can, because the oncoming storm promised snow in the Sierra, and I want to be on the east side of Donner Pass before the rain turns to snow.